Home / News & Events / 10th Annual Seniors Games Begins With Dancing, Dancing And More Dancing! 10th Annual Seniors Games Begins With Dancing, Dancing And More Dancing! 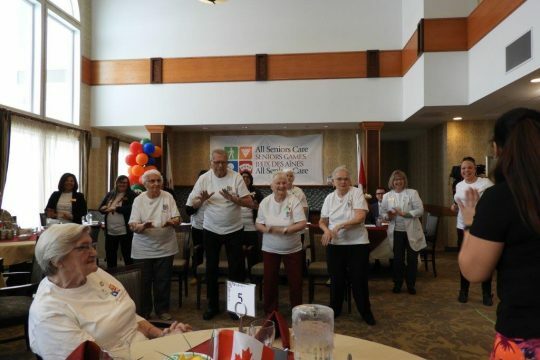 With the opening of the 2019 All Seniors Care Seniors Games across the country our residents and guests are ready for a week of activity, fellowship and dance. This 10th annual event runs until February 8th and is part of the commitment that the team at All Seniors Care Living Centres have made to helping maintain active and healthy lifestyles throughout the years at our beautiful retirement communities. All events are held indoors each day and several thousand older adults will enjoy fun and friendly competition by participating in the Games..
Our Chefs du Mission officially opened The Games in each building by welcoming guests and reading a message of congratulations and encouragement from our Prime Minister, The Right Honourable Justin Trudeau. Many celebrities and dignitaries volunteered their time to help make the event a success with Federal Minister of Seniors, Filomena Tassi, joining us at Cite Parkway in Ottawa while MP’s, MLA/MPP’s, City Mayors and Councillors were in attendance at the 26 participating Residences across the country to throughout the day. The theme this year is “Dance, Dance, Dance” and as we engage in a week of active living we saw many different dances highlighting the uniqueness of each residence. Across the country all of our seniors boogied, shimmied and danced the morning and afternoon away. At Preston Park II in Saskatoon, Resident Doreen exclaimed, “Ì love to sing and I love to dance. Now come with me and take a chance! Get up and dance!” while in Edmonton at Laurel Heights Evelyn S. exclaimed: “We sure had a great time doing the Chicken Dance especially seeing the big men (Eskimos football players) wiggle their tail feathers.” And in Stratford at Cedarcroft Mrs. B exclaimed: “There’s something about music that instantly puts a smile on my face.” Such joy and happiness across the country. then Medals Ceremonies and entertainment. Media and spectators are most welcome! For further information, please visit our website at http://www. allseniorscare.com/ or check out all the action and photos on Facebook https://www.facebook.com/allseniorscare.